Milepost 42 is proud to be a Champion of National Cybersecurity Awareness Month (NCSAM) 2018, joining a growing global effort among businesses, government agencies, colleges and universities, associations, nonprofit organizations and individuals to promote the awareness of online safety and privacy. A multi-layered and far-reaching campaign held annually in October, NCSAM was created as a collaborative effort between government and industry to ensure all digital citizens have the resources needed to stay safer and more secure online while also protecting their personal information. As an official Champion, Milepost 42 recognizes its commitment to cybersecurity, online safety and privacy. Co-founded and led by the National Cyber Security Alliance (NCSA) and the U.S. Department of Homeland Security (DHS), NCSAM has grown exponentially since its inception, reaching consumers, small and medium-sized businesses, corporations, government entities, the military, educational institutions and young people nationally and internationally. NCSAM 2017 was an unprecedented success, generating 4,316 news stories – an increase of 68 percent in comparison to NCSAM 2016’s media coverage. Kicking off its 15th year, NCSAM 2018 presents an unparalleled opportunity to leverage the month’s tremendous adoption growth over the last several years and expand cybersecurity and privacy education and awareness globally. 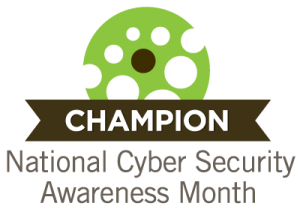 For more information about NCSAM 2018, the Champion program and how to participate in a wide variety of activities, visit staysafeonline.org/ncsam. You can also follow and use the official NCSAM hashtag #CyberAware on social media throughout the month. Milepost 42 is a technology partner for small business owners who want to focus on their passion and not the “techie stuff” needed to support it. Small businesses need technology –websites, email, automation – to run and grow, and they also need to be aware of the need for cybersecurity to ensure business continuity. Milepost 42 provides those services and planning assistance for small business owners who are ready to have someone else handle the “web stuff”. NCSAM is designed to engage and educate public- and private-sector partners through events and initiatives with the goal of raising awareness about cybersecurity in order to increase the resiliency of the nation in the event of a cyber incident. Since the Presidential proclamation establishing NCSAM in 2004, the initiative has been formally recognized by Congress, federal, state and local governments and leaders from industry and academia. This united effort is necessary to maintain a cyberspace that is safer and more resilient and remains a source of tremendous opportunity and growth for years to come. For more information, visit staysafeonline.org/ncsam or dhs.gov/national-cyber-security-awareness-month. NCSA is the nation’s leading nonprofit, public-private partnership promoting cybersecurity and privacy education and awareness. NCSA works with a broad array of stakeholders in government, industry and civil society. NCSA’s primary partners are DHS and NCSA’s Board of Directors, which includes representatives from ADP; Aetna; AT&T Services Inc.; Bank of America; CDK Global, LLC; Cisco; Comcast Corporation; ESET North America; Facebook; Google; Intel Corporation; Logical Operations; Marriott International; Mastercard; Microsoft Corporation; Mimecast; NXP Semiconductors; Raytheon; RSA, the Security Division of EMC; Salesforce; Symantec Corporation; TeleSign; Visa and Wells Fargo. NCSA’s core efforts include National Cyber Security Awareness Month (October); Data Privacy Day (Jan. 28); STOP. THINK. CONNECT™; and CyberSecure My Business™, which offers webinars, web resources and workshops to help businesses be resistant to and resilient from cyberattacks. For more information on NCSA, please visit staysafeonline.org/about. STOP. THINK. CONNECT.™ is the global online safety awareness campaign to help all digital citizens stay safer and more secure online. The message was created by an unprecedented coalition of private companies, nonprofits and government organizations with leadership provided by NCSA and the APWG. The campaign was launched in October of 2010 by the STOP. THINK. CONNECT.™ Messaging Convention in partnership with the U.S. government, including the White House. NCSA, in partnership with the APWG, continues to lead the campaign. DHS leads the federal engagement in the campaign. Learn how to get involved by following STOP. THINK. CONNECT.™ on Facebook and Twitter and visiting stopthinkconnect.org.